Sat Sharma, MLA, Jammu West, during his visit to Ward 35 on Tuesday. 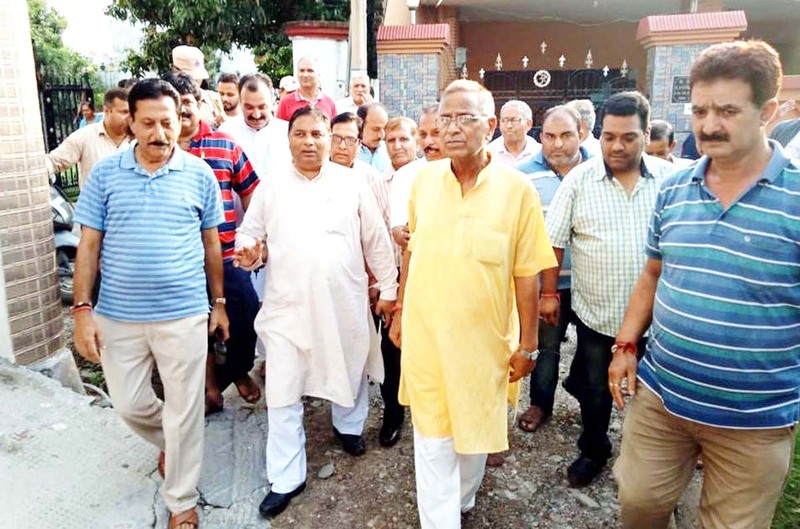 JAMMU, Sept 4: Former Minister and MLA Sat Sharma (CA)today visited Ward 35 where a large number of locals met him and apprised him of some problems being faced by them from quite some time. Sharma was also accompanied by social and political activists. Officials from various departments were also present during MLA’s tour to the area. Speaking on the occasion, Sat Sharma said that an extensive tour was conducted in all the areas of the ward along with officials of various departments and locals of the ward and it was brought to the notice by locals that some lanes and drains in the area need immediate repairs for which he directed the authorities of Jammu Municipal Corporation (JMC) to immediately take up the works in hand so that people are not made to suffer. Locals also apprised him of the situation regarding irregular supply of water and poor sanitation system in the area for which the MLA directed the concerned authorities to check both the problems and taking a strict note on the sanitation system in the area, he directed the Health Officer of JMC to ensure proper sanitation in the area. He also appealed to the masses to spare sometime in a day or week to promote the vision of “Swach Bharat” in order to make a “Clean and Green” Jammu. State secretary, BJP and Incharge Jammu West, Praduman Singh, Mandal president ,Vijay Sharma, Yash Pal Mantoo, Kuldeep Magotra, Master Yash, Amit Sharma and several others also accompanied MLA during his tour in the Ward.